Blog originally posted on the Every Mother Counts website here. Hospitals are not only for the sick. It is essential that women receive skilled health care when they give birth. In Tanzania, the rate of maternal and infant mortality is one of the highest in the world. 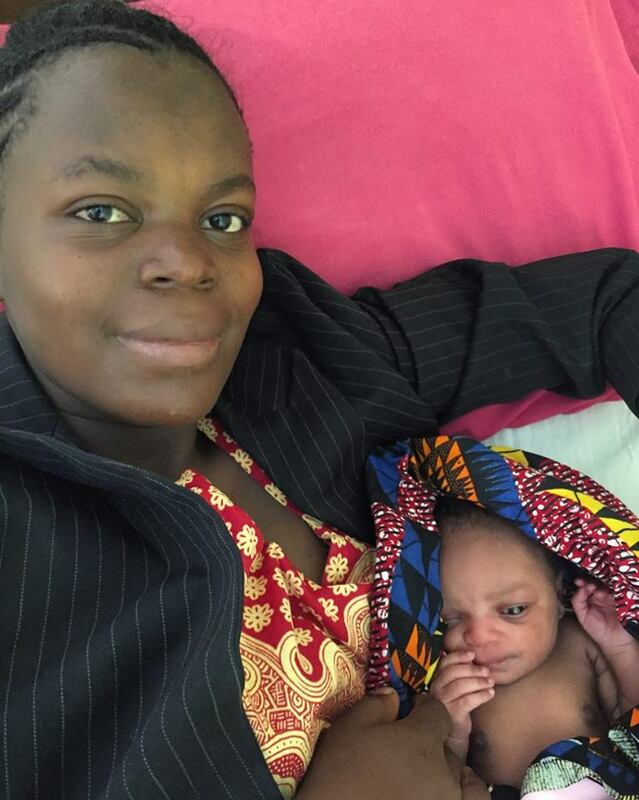 FAME-Africa encourages women, particularly those with a high-risk pregnancy, to get to the hospital for their birth, especially if they do not have access to a skilled birth attendant, even if it may require many hours for their journey. In my two weeks training the staff at FAME, I assisted in many births. I was asked to come and facilitate training for the medical team in “Maternal Positioning for Optimal Fetal Positioning.” This is a specialized training that optimizes fetal and maternal well-being by helping the fetus move into the ideal position for birth through a variety of maternal positioning. It is a very safe and straightforward process. The first step of this process is to view the pregnant mother’s abdomen while she is lying flat on the bed. You get down to the level of the bed and observe which side of the uterus the fetus is leaning towards. Next, you do what is called ‘Leopold’s Maneuver’ to determine where the back of the fetus is in relation to the maternal spine and where the head of the fetus lies in relation to the maternal pelvis. You might then do a sterile vaginal exam to determine the dilatation and location of the fetal head. Based on these observations, you will then instruct the woman, through demonstration and a thorough verbal explanation, which positions she might take to facilitate moving the fetus into a more optimal position: specifically, the fetus’s back on the maternal left. Studies are consistent in the conclusion that if a fetus is in one of the many less optimal positions at delivery, this alone is associated with a higher risk of adverse neonatal and maternal outcomes. This is why I am passionate about what I do and why I want everyone to learn more about it. A young primigravida (a woman pregnant for the first time) from the Maasai tribe was admitted to FAME at 5:00AM in labor. She was examined vaginally prior to my arrival at 8:00AM, and was found to be 2cm dilated and the baby had not yet descended into her pelvis. She reported that she had been laboring for 24 hours. When I met her, she was lying laterally in her bed. Each time her uterus would contract, she sang out in a high pitch cry while rapidly slapping her lower back. With the help of Tanzanian nurses interpreting for me, I told her that I would very much like to see if I could help rid her of her obvious lower back discomfort. She immediately said yes, and we walked with her to the room in the back of the ward where two delivery beds occupy a room that also serves as a nursery. My Tanzanian RN peer asked permission to touch her body and we viewed her abdomen, then placed our hands on her baby in utero and concluded what position she was in. This little one had somehow decided that the maternal right side was her temporary home while her head was up against the maternal iliac crest (hip bone). If the labor continued with the baby in this position, it could present multiple problems. Her contractions were palpating strong and were frequent, occurring every three minutes. Our patient was visibly tired and appeared to be in a lot of pain. Our goal was to help the baby get over to the maternal left side, therefore decreasing the discomfort to the woman’s sacrum. First up was a 5-minute warm shower. The water was aimed frontal and low in the abdomen. This can help relax the muscles and ligaments supporting the uterus. Next, she was instructed on how to do some yoga stretching to bring the respiratory diaphragm off the top of her uterus. The abdominal lift came next to help the infant into a chin flexed position that would enable her to rotate to the other side of the uterus. Our last maneuver is named the “side lying release.” She was assisted into this lateral position in bed and her top leg was brought over and off of the bed. This technique stretches the lower uterine ligaments to make more room for the infant to rotate. Once her baby was determined to be in the optimal position, I instructed her to get out of bed. I told her to use her voice to help release the intensity of her powerful contractions that were now felt solely in the front of her uterus, near her cervix. She was encouraged to make noise through calm rhythmic breathing and noises that she could call her own. I told her to listen to her body, as it is wise, and will guide her through purposeful movements. Once I gave her this permission and guidance, she became very fluid and danced through her contractions in a way that I have not witnessed in a very long time. She arched her back, swayed her hips, squatted, lifted her arms and waved them in unison. Her voice could be heard throughout the unit and out onto the paved walkways of this open facility. At one point, a male doctor came to check on her and he joined her in dance. We, including the woman, thought this doctor was funny and so we all laughed and danced together. I encouraged the woman to continue in the upright position, taking short moments to rest when she could, while sitting on the birth ball with her head leaning onto the bed. Food and tea was encouraged throughout her labor. Her mother was always by her side. The next morning, I did not attend the daily doctors’ meeting and instead looked for the woman so that I could find out the result of her amazing efforts in labor. Isdori, one of the male midwives on staff, had assisted in her birth. I had left at 4:00PM, and she had delivered 2.5 hours after that, at 6:33PM. She had pushed for as little as one hour and her daughter had an Apgar score (a quick method to summarize the health of a newborn) of 9/10. I walked into her room, occupied by two other post-partum mothers. She was still shielded by her draped mosquito netting. Her body was turned towards the wall in a fetal position wrapped around her newborn. I called out her name and her face turned towards me. She smiled – a smile that told me, “I did it, I am proud.” I stroked her forehead and smiled back, telling her she was so strong and brave. Her expression, the one of ultimate self-satisfaction, made my long trip to Karatu, Tanzania all the more worthwhile.